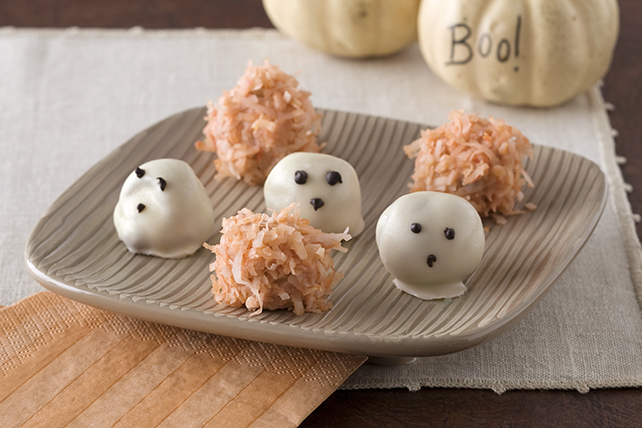 File these Easy Halloween Truffles under ghoulishly delicious. These ghost and pumpkin-shaped Halloween truffles have chocolate centers that are a treat to bite into! Place BAKER'S ANGEL FLAKE Coconut in resealable plastic bag; seal bag. Add 1 to 2 drops each of red and yellow food coloring; close bag and shake until coconut is evenly tinted. Use a toothpick to dip the truffle into melted white chocolate; shake off excess chocolate then place truffle on waxed-paper. This may leave just a small hole on top that can be covered with a tiny dab of chocolate.